In October 2016, The City of Calgary purchased a parcel of land in the community of Sage Hill located at 251 Sage Hill Boulevard N.W. for the development of a Calgary Public Library branch and Bus Rapid Transit (BRT) hub for the five Symons Valley Communities: Sage Hill, Nolan Hill, Evanston, Kincora, and Sherwood. In addition to a library and BRT, The City is exploring other site development opportunities for additional City services, other government service partners and developers. The City is currently working with internal City business units and the public to develop a Master Plan (outlining timing for build phases, transportation requirements and gross land arrangement of City services) which establishes a long-term, shared vision for the area to guide further development. Once the Master Plan has been developed, The City plans to submit a Land Use Redesignation Application and Outline Plan Application in 2018. 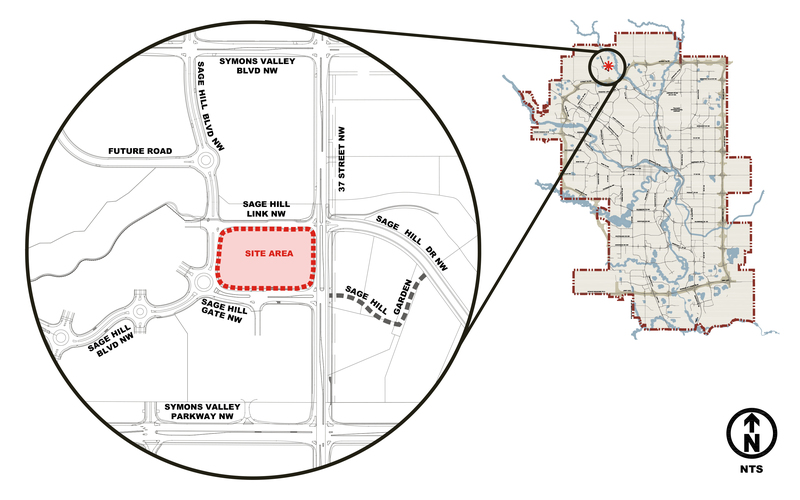 The site is centrally located within five developing communities in the Symons Valley area in northwest Calgary: Kincora, Sage Hill, Nolan Hill and Evanston. The future population of these areas is expected to reach 55,000 people. Please click here to view the What we heard report from June 2017. Please click here to view the boards presented at the Open Houses in Spring 2018. Please click here to view the What we heard report from June 2018. Thank you to everyone who participated by providing input into the land use redesignation application.